The first thing you need to do is to choose your route. This is very important. With so many cities to choose from and only 3 (ish) weeks in which to see them, picking a route that allows for optimal exploration is imperative. (Tip: try to start and end your trip in the cities you want to spend the most time in so as not to eat into your travel time). Try, if you can, to not do stupidly long train rides that will take up a whole day that you could use for exploring. But if you have to do a long journey, try and make it a night train - it'll save you money on accomodation for the night, too. 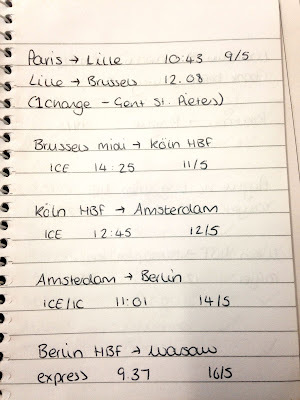 Not everyone likes to plan the trains in advance because one of the joys of the interrail is the ability to jump on a train whenever you like and just go. Yes, that is great, but you cant control the prices and you may be hit with a surprising reservation cost or maybe not even get a seat. And you really don't want that. You don't need to book tickets for every train you plan to get, but make sure you find out which ones needs reservations and make them. That is important. Or, even better, find a more "scenic" route that doesn't need a reservation. The Thalys direct train from Paris to Brussels took one hour and cost £40 to reserve a seat (the ticket is still free with interrail pass), but travelling from Paris to Lille to Gent then to Brussels took an extra 2 or 3 hours but it only cost £7. For some of you, that may seem excessive, but when you are counting the pennies that is an excellent way to save money. If you do that on three expensive journeys (which is likely in western Europe! ), you may save yourself in excess of £100. It really does add up. Also, make sure you know which local travel is free with the pass, for example the S-Bahn in Berlin. 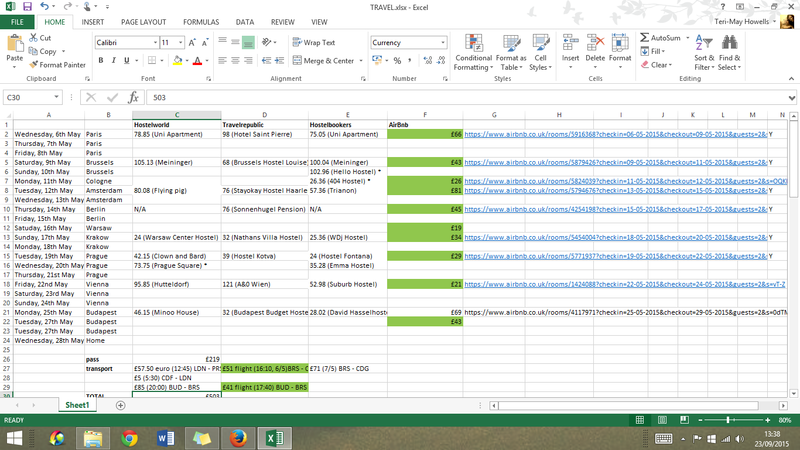 The picture on the left shows all the trains and times that I wanted to get, based on the knowledge of reservations that I had gained through research. 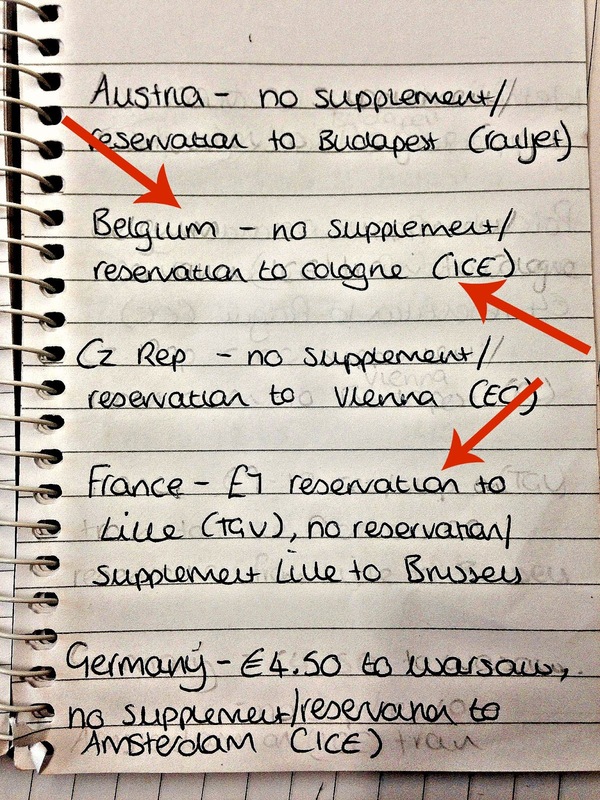 Before you plan your train times make a note of the country/city of departure, how much (or if you need) a reservation is and the tye of train, e.g. TGV, ICE, CE etc., as I did in the picture on the right. These are important details to know. 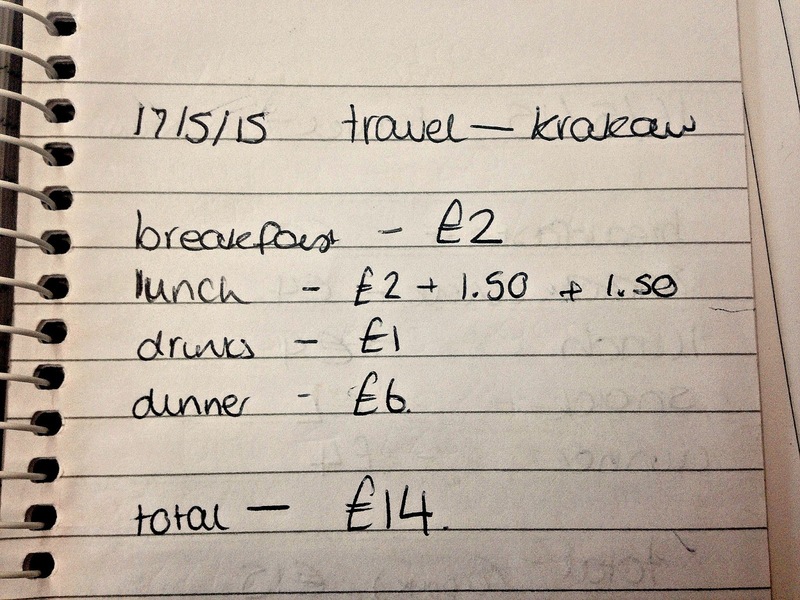 One of the most important ways to save money is by putting effort into finding the cheapest accomodation possible. It is definitely the most longwinded and least enjoyable part of the planning process but you will be so glad you did it. 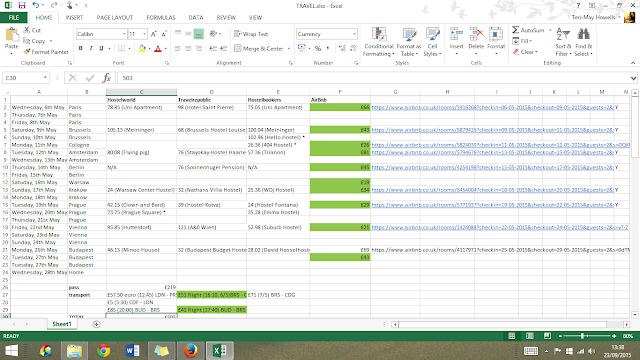 It's spreadsheet time!! (I am a super loser, I know). I compared Travelrepublic, Hostelbooker, Hostelworld and Airbnb for each city before looking at the cheapest more in depth to see what worked out the best. For example, a £15 a night room outside the city may end up working out more expensive than a £25 a night room in the city centre by the time you factor in travel costs. 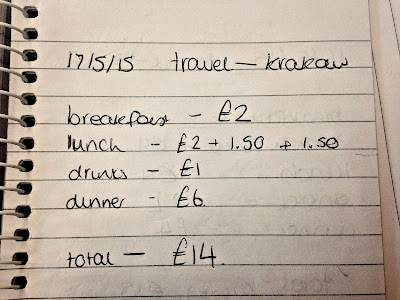 Or if a slightly more expensive room provides breakfast, that could save you a couple of quid. For us, Airbnb worked out the cheapest by a country mile in every place. It was a god-send. However, I didn't want to stay in shared dorms in hostels. We were travelling as a couple, we wanted privacy, and private dorms in hostels are often as much as a hotel. Perhaps if you're travelling solo or as a group and don't mind sharing, hostel dorm rooms might be cheaper for you and you'll meet people. (Tip: don't be put off staying a bit further outside of the cities, you often end up in really cool places and the transport networks are insanely good - you'll be in the centre in no time!). In reality, only you know how much luxury you are willing to forgo in the name of saving money. If you use airbnb, you get the opportunity to stay in some damn cool places. We stayed on a little boat in Amsterdamn with no toilet, shower or electricity and it was one of the most memorable experiences of the trip. Don't roll your eyes at me when I say this, but I highly recommend you plan some restaurants. Not only is it a key way to save pennies but it's a great way of ensuring that you get some very good food and a taste of real local cuisine. I used likealocal guide to get a couple of "cheap eats" in each city and they were definitely some of our favourites. Stay away from tourist spots where they inflate the prices - wander down side streets or find cool suburban areas and make the most of street food and litle eateries. In Amsterdam, we found a very strange looking, tiny Vietnamese restuarant that just looked like a kitchen but it was so cheap and the food was beautiful. The Old Towns and Jewish Quarters are often very good places to eat authentic local food on the cheap. You don't even have to use the places on your list if you find other places that look good, they just help you to avoid incidents like our #PizzaHutGate in Brussels. What a bloody drama that was. After not eating properly for 10 hours, we were starving and couldn't find anywhere to eat (it was a Sunday - beware of Sundays!!) so we ended up in Pizza Hut; a place I don't even eat at when at home. Having to waste both money and a meal time that could have been wonderful, on an average chain restuarant was soul destroying. Another tip: cook as much as possible. I know it sounds boring but really, how exciting is breakfast anyway? Buy a box of eggs, a tin of beans or two, and a little loaf of bakery bread and thats breakfast for two on two mornings for less than £5. 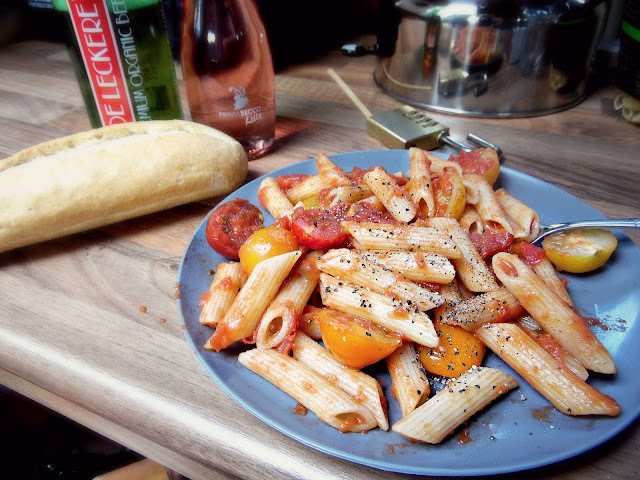 Occasionally we cooked tuna pasta or tomato pasta that cost a euro or two and left us more money for fun things. And I don't know about you, but I love wandering round foreign supermarkets and seeing what they have! Pasta, sauce and tomatoes we cooked on a camping stove (With pepper from McDonalds sachets that we collected throughout the trip) and a couple of bottles of booze! I also think it's important to note that Martin and I aren't big drinkers. So if you're planning on having a boozy holiday with a heavy session every night you will absolutely not sick to an £800 budget. However, Martin had a local beer with nearly every dinner, we enjoyed a good couple of cocktails and a bottle or two in the pub on a few occasions. So yes, you can drink. Just be mindful of what you're spending. You should also know that we did not stop ourselves having treats and buying spontaneously. We had at least one ice cream each every day (yeah... we got fat) and enjoyed too many chimney cakes and local things whenever we saw something we fancied. We just tried to remember what we spent. Don't buy bottled water. Take a bottle of your own and just fill it up yourself. Water in Europe is safe to drink and not being caught short and having to buy a bottle whenever you're thirsty will save you money. We also didn't buy drinks in every place we ate. Buying a can of coke etc whenever you have lunch or dinner will add up fast, and realistically do you need it? Water is important to keep you hydrated if you're walking a lot and is a lot more thirst quenching than fizzy drinks. Be flexible with dates so you're able to get the best prices for flights as they will be one of the most expensive part of your trip. Additionally, try and fly to and from cities where flights are cheap. Have a browse and see what works best for your budget, route and dates. Keep a note of everything you spend. It sounds laborious but it's really easy and helps you to see if you're going overbord or if you have some room to breathe. It's also a good way to see what's taking up the most of your budget, for example if you notice you're spending a tenner a day on breakfast it might be useful to cook yourself. It helps to set a budget for yourself some days. 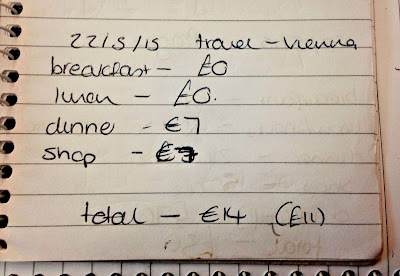 Not every day, of course, but if you've had a costly few days which is bound to happen (Paris cost us considerably more than any other city), perhaps try and budget yourself for a couple of days. Save money by making a picnic and enjoying the free sites! Most of all, avoid scam artists. Martin and I had 10 euros stolen off us by women pretending to collect money for a deaf and blind children's charity. We saw them throughout Europe pestering tourists. If someone with a clipboard asks if you speak English. you're best just assuming it's a scam and walking away. It was such a low moment of our trip. 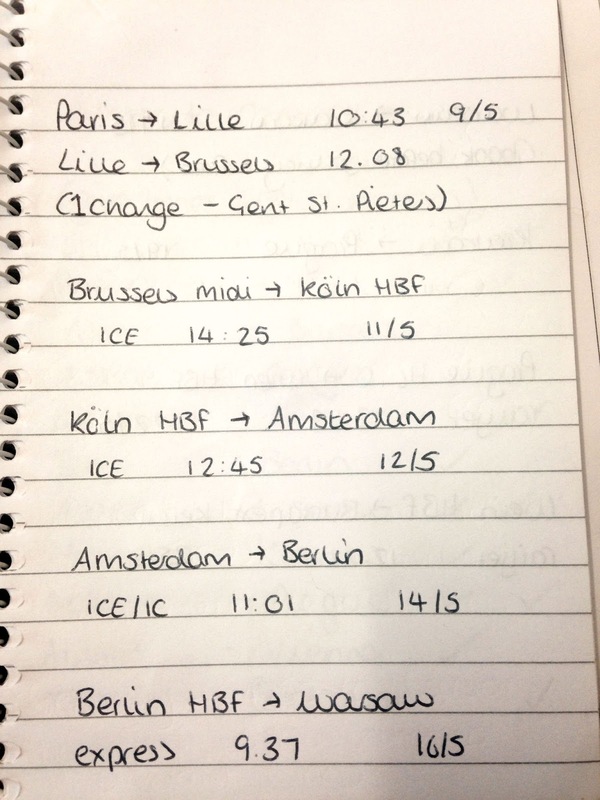 This is so helpful as I really want to go interrailing next year with a friend so I'll take your tips on board! Also I like how you're a lot like me; when I go away I do a lot of research and plan every little thing to make sure I know what I'm doing and I know I can get to do everything I want haha! Amazing post! 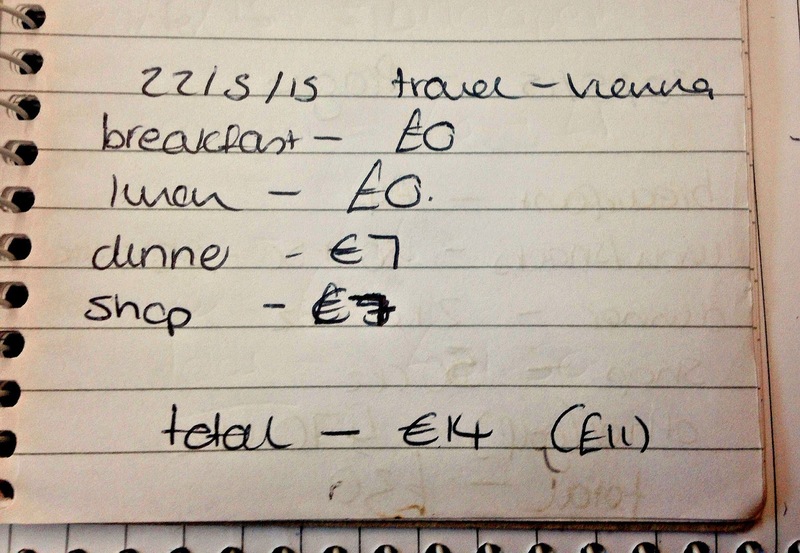 I'm the worst at organising in advance so it's great to see how you planned your trip down to ever last penny, or should I say Euro? This is such an amazing post! 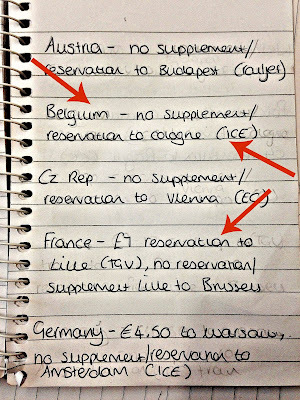 I'd really love to travel around Europe one day but it's all the planning etc. that puts me off. I can be organised when I want to be, but I think I'd just be stressed about the whole thing going wrong! I am a bit of a worrier though. I'm definitely going to keep this post in mind if I ever do get around to doing it, you're so detailed. 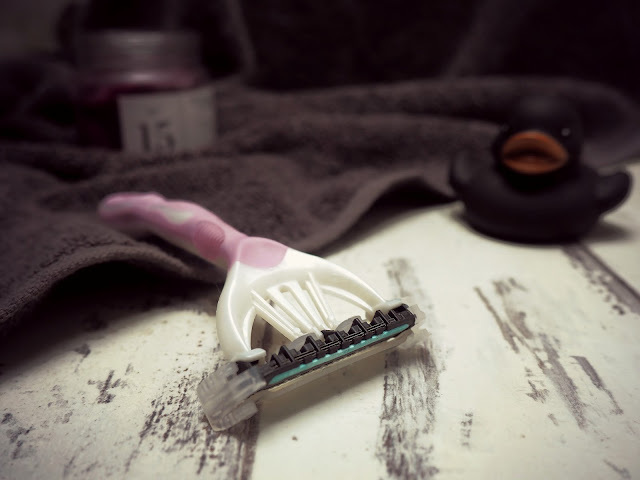 This was such a fab post! 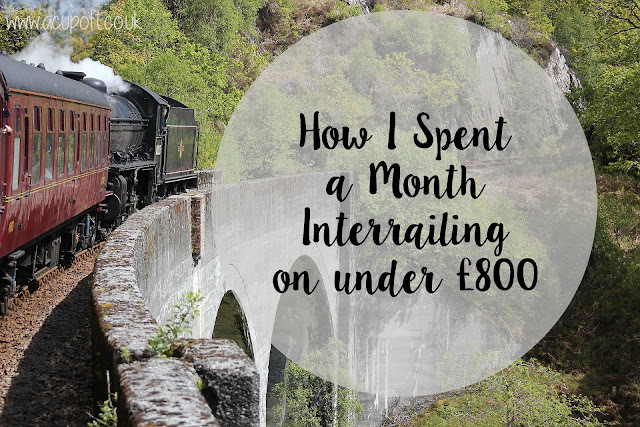 I've been looking at Interrailing, looks like such a good experience. Will be calling on this post again when I decide to go! Thanks for this post! I'm going this summer with two girl friends and I'm so excited I can't even contain! I'm definitely going to use these tips especially the one about writing down what I spend each day, it'll be really handy to keep track and to know where I have breathing room. Literally living off this post! Wooooooow! thank you for this post, I'm planning on inter railing this summer and this has got me off to a good start! Thank you!